LK here: We 97'ers did it before!! The K–12 championships are in Orlando this Dec. Please, donate ASAP, whatever you can. Joseph, this week, is being inducted into his schools Hall of Fame for his having so positively effected underprivileged children. Please help! Check out the links about the successes YOU folks made possible! You and the ICC are our inspiration, Marty. ICC's VP Marty Grund (LateKnight) met Joseph Ocol at the SuperNationals in Nashville, Tennessee, and was struck by the passion and dedication of this humble math teacher, who out of his mere teacher's salary bought food and chess sets to teach chess after school, thus keeping them off the streets during dangerous hours of the day. This happened in 2004, and since then Joseph and his pupils have come a long way. Tamya Fultz, a seventh grader at Earle STEM Academy - one of Joseph's pupil, won with a perfect score an important tournament! And she was the only girl among 25 medalists. 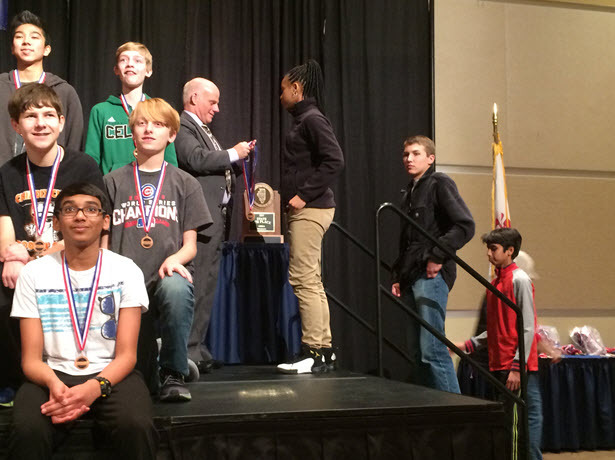 Student Tamya Fultz-- a 7th grader, team captain and the lone girl member of the Earle STEM Elementary School chess team—won the 2nd Runner-Up medal in the IESA State Chess Finals that was held last Friday and Saturday (February 24 and 25) at the Peoria Civic Center, Peoria, Illinois.Tamya was the only girl to win a medal in the IESA State Chess Finals, 8th Grade Division. Tamya was the only African-American to win a medal, thus capping a meaningful commemoration for Earle STEM Elementary School of the Black History Month, with a "Hidden Figure"-- a movie that the students saw last month.Tamya was also the only CPS student among those medal winners. The rest of the winners came from well-funded suburban and private schools. Tamya receiving her medal from IESA Executive Chris Merli, IESA Chess Tournament Director and IESA Advisor. 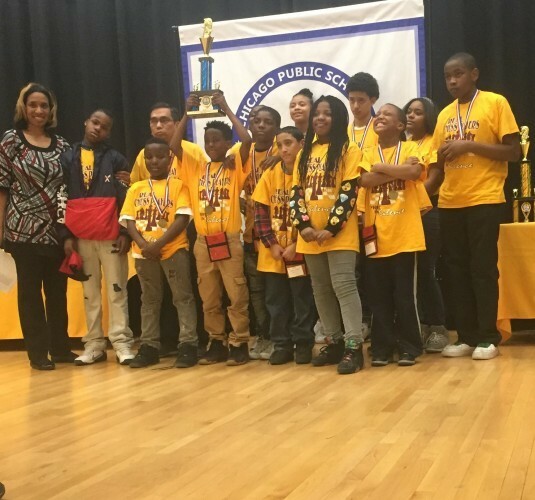 The chess team of Earle STEM Elementary School won 3rd Place in the Chicago Public Schools Academic Chess Play-Offs. Joseph sent a letter to Marty, to express his joy and gratitude. Please see attached pictures, the latest of the achievements by our chess kids as a result of the support they have been getting from you and from ICC. Yesterday (March 18), the chess team of Earle STEM Elementary School won 3rd Place in the Chicago Public Schools Academic Chess Play-Offs. Thus we can already tell the world that our kids at Earle (and at Englewood) can excel in chess despite all the challenges they have been facing in their community. Also, we have the newly crowned Chess Queen of the South. Our 7th grader, Tamya Fultz, won 1st Place individual chess by achieving a perfect score (all wins, no loss) in this tournament. This is the first time ever in the history of our school and our community that a simple girl, a 7th grader, has won 1st Place in a CPS chess tournament. It's all your fault, Marty. You and ICC made these kids excel in chess. Were it not for you, they would not have won and would have achieved nothing. Thank you very much for everything you and ICC have done for them and for our chess program. In 2015 his kids once again trophied! The Mayor of Chicago was so impressed he invited the kids, coaches, and parents for accolades at City Hall. Joseph has informed us that due to the successes they’ve achieved the Chicago Public Schools have adopted a Chess curriculum!! Take a look at the City Council of Chicago’s resolution thanking ICC, you !!! "These kids belong to below poverty line families and are residents in the Englewood area, which is one of the worst crime-prone areas in the country. I know that we all can make a difference in their lives. Everyday, there are shootings going on in the Englewood area, and I am touched by these kids desire to come to school everyday and stay in school after school, instead of being in the streets. They love so much to play chess to improve their critical thinking skills that their academic scores are also high. They see chess as a tool to improve their lives. I am sure we all can help them make that difference in their lives. Please help them. There's nobody else that they can go to-- except to you and to the saints and angels of ICC. Whatever your heart desires will surely go a long way to make a difference in the lives of these kids."